MLSS and its members have done some good work over the years in an effort to protect Howe Sound. MLSS greatly appreciates the grant support from the PSF CSP (Pacific Salmon Foundation Community Salmon Program) to purchase the banners and table throw that feature the MLSS rockfish logo. The colourful promotional materials definitely attract the public eye during our outreach events. Through our education and outreach BIP events, MLSS endeavours to broaden the public knowledge and awareness of our local food web and the value of protecting marine life so that we ensure sustainable fisheries. Rockfishes, salmon, and glass sponge reefs are a big part of our conversation about our local food web. Congratulations to Glen Dennison, BOD Director of Howe Sound Projects, as the recipient of two well-deserved awards this Spring for his hard work and dedication to protect of the glass sponge reefs in Howe Sound. The Coastal Ocean Research Institute of the Vancouver Aquarium awarded Glen the Innovation in Technology Award for the many types of equipment that he designs and builds for minimal costs to use in his research and documentation of the sponges and the environment in which they live. The MLSS Board of Directors presented Glen with a glass sponge award made by fellow BOD member, Zora Feron, for his discovery of the sponge bioherms in Howe Sound. Well done, Glen! 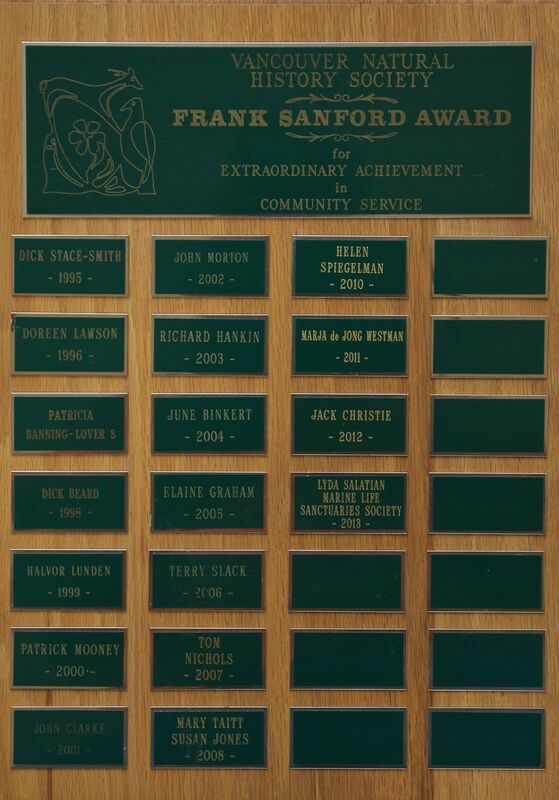 The Marine Life Sanctuaries Society is extremely proud to be the recipient of this year’s Frank Sanford Award from the Vancouver Natural History Society for extraordinary achievement in community service. We look forward to another year of hard work and engaging local communities in the protection of marine life in British Columbia!